I’ve noticed that despite knowing what to do to move my business forward, I’m often hesitant to take action. There are many reasons why I hold back. Sometimes I’m scared because I don’t know what will happen next. Other times I’m scared because I do know what will happen next! Then there are times when I feel I lack the skills or knowledge needed. In this case, my anxiety is usually a sign that I need to learn something new before moving forward. What I often find when I start to dig a bit deeper, that my initial understanding or perceptions were all wrong – and I was, in fact, holding myself back for nothing! 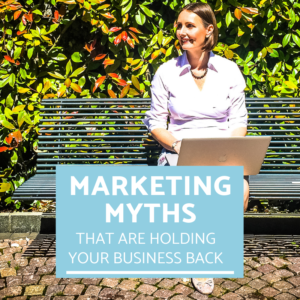 In the conversations I’ve had with women about marketing their small business, I’ve seen many misunderstandings about what marketing is all about. In my last post I shared what effective small business marketing is all about. 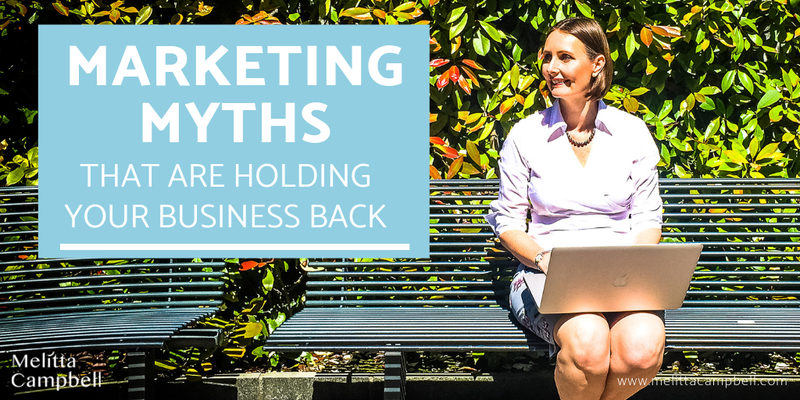 Today I’d like to bust some of the Marketing Myths that are holding women back from building the successful business they both want and deserve. Ready?! Promoting your business is part of marketing, that’s true. But ‘Promotion’ is only one of the 7Ps of Marketing according to the Chartered Institute of Marketing. Furthermore, Advertising is only a small part of Promotion. 2. Cause you to miss out on dozens of other highly effective ways to get your business in front of your ideal clients. Check out this list of 100+ Free ways to promote your small business for example. I studied Marketing for many years, so I know that in the world of international business, marketing can get very complex. But for small businesses, it can be very simple. The goal of marketing is to put the needs of your ideal client at the heart of every decision you make in your business. For Corporates that requires a lot of sophisticated research and analysis. But for small business, it’s much easier as they tend to be (or should be!) in close contact with their market. Another aim of marketing is to become known, liked and trusted in your market place. Again, for many small businesses, this is a relatively simple process. You can learn more about how to market your small business here. There are a couple of myths wrapped up in this false belief. Firstly, you don’t need to be consistently innovating when it comes to your marketing. In fact, there are many advantages to keeping things constant! If you want to become known and easily recognisable, then one consistent message and imagery are going to serve you far more than changing the way you communicate regularly. People like stability and trust consistency. If you look at the big brands like CocaCola and Apple, they have changed very little over the years. Secondly, you don’t need to be creative. If you are, that’s great! But monitoring what works and what activities and messages drive the most engagement from your ideal clients, and then building on this, is powerful. So my advice would be to keep your core message and image the same. Then experiment with how you get in front of your ideal clients. The 100+ Free Ways to Promote Your Small Business eBook (which is in itself free!) will give you lots of ideas to help you get started. Marketing is all about positioning your business to attract the right people, building relationships, and nurturing prospective clients through the sales cycle. This can be a long process. It can be helpful to think of marketing as a funnel. You need to put a lot of water in the top (i.e. prospects) to get a small steady flow at the bottom (i.e. clients). If you stop pouring water in the top, you soon stop getting any at the bottom. It can take a while for people to go through your funnel, so you need to be consistent in your marketing to get a consistent flow of qualified leads for your business. This process can take days, weeks or even months. While marketing and sales are closely linked, they are in fact two different activities. It can be a costly mistake to think otherwise. Marketing is about positioning, lead generation and delighting customers. Sales is about turning the warm prospects that your marketing generates into paying clients and sealing the deal. You’re unlikely to successfully sell to someone who doesn’t know anything about your business and doesn’t know how you can add value for them yet. That would be like proposing to someone before you’ve even gone on a first date! It’s a costly mistake that many new business owners make. It can be helpful to think of marketing as the dating process and sales as the proposal. For more about the difference between sales and marketing, you can read the Business Dictionary definition. As mentioned in marketing myth #4, marketing is a process requires time, consideration and planning. Putting ‘something’ out there, without carefully thinking through what, where, when and how, is at best a waste of your time and resources, and at worst can destroy your brand and reputation, limiting your future success. Marketing needn’t be complicated, as explained in Marketing Myth #2, but it must be planned, appropriate to your ideal clients and consistent. Many new business owners and enterpreneurs take time to build a website before their launch their business. Unless you have an online business, however, this is not required. Moreover, it’s a waste of your time, energy and money. Having a website alone won’t bring you leads or sales. You need to have a complete, well planned marketing campaign designed to drive targetted traffic to your site. This should ideally be an on- and offline campaign. Very few people will find your website on their own. Unless you have already found, sold to and serviced clients, what you put on your website will be theoretical. You’ll be guessing what your clients want from you and what they love most. Yu’ll be guessing about what words, phrases and images resonate best with them. And you’ll be guessing what they need to know and at what stage. In most cases, if you launch your business with a website, you will need to completely redesign it a few months down the track once you’ve learned what clients really want and connect with. You don’t need a website before you launch your business. Websites don’t attract much traffic on their own, you need to drive traffic to it. Creating a website before you have clients, is likely to waste you time and money. A website is a small part of your overall marketing strategy. Funnel or Marketing hacking – looking at what someone else is doing and copying it – is dangerous. Firstly, you don’t know if what they are doing is working! There are many seemingly successful people who are in fact, putting so much money behind their marketing that they are barely breaking even. Unless you know exactly what is behind their campaign, it can be hard to judge what really works. Secondly, there are very few completely identical businesses. Therefore, what is working for one business doesn’t always translate into success for another. By all means be inspired by what others are doing, but adapt their strategies to suit your business and objectives. And of course, test everything thoroughly before putting your entire marketing budget behind it. Getting clear on your objectives, knowing your clients and then building a strategy and campaign that is perfectly suited and aligned to your business, is by far the best strategy. This will make your business stand out far more than any ‘me too’ campaign. This may time a little more time, but it will deliver much better results! Working in marketing and communications for more than 25 years, I learned that the best marketing is perfectly aligned to the both the business and the client, and simple to implement consistently. This can be acheived by following a structured process that ensures that both your needs, and those of your clients are built into the fabric of your organisation. Even if you are a solopreneur with a single product or service, you can acheive a lot more success, with a lot more ease, if you use a clear, proven structure to build your business. I’ve created the Dream Client Blueprint program to help you do exactly this. In just 12-weeks, you’ll have a clarity around your purpose, vision and ideal business model. You’ll also know exactly who your clients are, the value you offer them and how to differentiate your offer from the competition. You’ll also work on your messaging and marketing strategy, so you’ll know the steps to take in order to find, engage and convert your ideal clients consistently. No more doubt, no more wasted time or money, but a clear plan you can implement with confidence. “Following the weekly videos and completing the workbooks to apply the lessons to my own business, has helped me focus on what’s important and regain my motivation and passion for my business. “I am clear about what direction to take, I know exactly what I need to do, and I have the tools, understanding and confidence to take consistent action. Yes! Marketing a small business can be scary, time consuming, and fun all at the same time in the beginning of a small business. It’s hard to put yourself out there and market your business but so rewarding when you receive engagement, site visits, and sales! Marketing is key!